Vampire films are two a penny these days, and if I see any more teen hunk vampire nonsense I’ll scream like a girlie. Thankfully, there are none present here. I’ve always thought that vampires should be evil abominations, but this film even side-steps that convention. It’s really rather refreshing, because it’s so different. Bram Stoker is said to have based his Dracula character on the real life Vlad Dracul, of Wallachia (or Transylvania) – also known as Vlad the Impaler, because of a penchant for putting his enemy’s bodies on huge spikes. 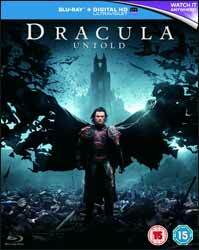 Much of Dracula Untold is based on real documented history. In this version, as in real life, he is just as much a victim as a vanquisher. All he is trying to do is save his family and his people from an aggressor focussed entirely on conquest. Therefore, in this fictional element of vampirism, Vlad makes the only choice he can, which makes for a celluloid explanation for hundreds of bodies on spikes and the return of his ruthless reputation in battle. Even then, he has the best intentions of turning things around and rejecting the borrowed evil. This is pretty much a British project. Director Gary Shore wisely gets in, says what he wants to say with no padding, and gets out again, leaving a tight and concise film of only around an hour and twenty minutes. Luke Evans is practically faultless as the protagonist (no over-acting or flamboyant theatrics), there’s Charles Dance, and it’s good to see Paul Kaye as a priest. The special effects promote the action, rather than taking over the plot as they often do in big Hollywood movies. I love the use of CGI bats for Vlad’s battle moves. In fact, there is only one thing I don’t like about Dracula Untold and that is the epilogue-like ending. It was probably meant as an intriguing cliff-hanger, but in my opinion is ridiculous and totally unnecessary. There are some tasty extras on the disc. The Land of Dracula shows a map with highlighted points; each location clicked on shows a short behind-the-scenes moment for that place. There is a commentary with the director and production designer. Dracula Retold has some cast and crew relaying the story. There are deleted scenes with optional commentary. A Day in the Life of Luke Evans. Slaying 1000 is a featurette showing how a scene was created and shot. Luke Evans on Creating a Legend. An alternative opening with optional commentary. All in all, this release is well worth a look. An adaptation which I can believe even Bram Stoker himself would have supported.